Spring is in the air, and woodland critters are out to play. As the seasons change and blossoms bloom, farm animals emerge with their little ones in tow. 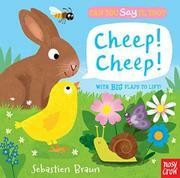 This lift-the-flap board book contains five double-page spreads, each featuring a different spring scene. A full-grown animal is in view on the left, and its young are hidden beneath a flap to the right. Text asks little readers, “Who’s that under the flowers?” or, “Who’s that beside the basket?” When they lift the flap, they discover an adorable chick or kitten and further text describing the sounds that particular baby makes. Little readers learning to talk will enjoy the variety of sounds as well as the brightly colored, rounded, and painterly illustrations. The pages are bound in a sturdy, faux hardcover fashion, but the flaps are a bit flimsy. Active readers will certainly destroy them after several readings—which they’ll probably want.